Our Micro Mini Loader only needs a clearance of just 780 millimetres. Our Micro Mini Loader is the machine you need when your site access is tight but the job you have requires some powerful equipment. For the Micro Mini Loader to enter your site, we only need a clearance of just 780 millimetres. That’s less than a metre! But don’t be fooled, the Micro Mini Loader might be small but it’s certainly no weakling. With the correct attachments, this machine can take on a wide range of tasks from post hole drilling to site levelling. When you hire this magnificnet machine you not only recieve our micro mini loader, you'll also have one of our qualified operators working on your site. Our Micro Mini Loader comes with a certified operator. The attachments available for the Micro Mini Loader include post hole drilling and a chain digger attachment for precise and expert trench digging. This Micro Mini Loader is also perfect for site levelling, soil removal and rubbish removal. As a bonus, when we remove rubbish from your site, we’ll also properly dispose of it for you. The Micro Mini Loader is also great for turf preparation and concrete and paving preparation. This machine really can pack a punch. 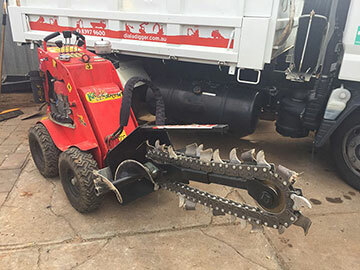 When hiring with Dial A Digger, you not only get the magnificent Micro Mini Loader, you also have a qualified operator who can drive the machine with incredible skills and dexterity. Our experienced operators can use the Micro Mini Loader to its fullest potential and get this loader to fit almost anywhere. Big things really do come in small packages, so call Dial A Digger today to discuss how you can hire the Micro Mini Loader for all your earthmoving work. Here at Dial A Digger, we are experts in commercial and residential projects. With over 30 years of experience behind us, we are backed by professional accreditation. 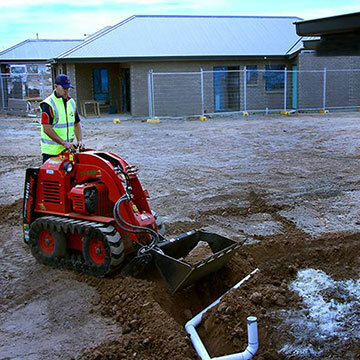 We have the knowledge and skills to be able to take care of all your earthmoving and trenching needs. Not only do we supply all our own equipment, we also have highly skilled professionals who have experience working on projects of varying scale. No job is too big or too small. Our fully insured and back-ground checked operators are ready to take on your next project. When you need a big job done but access is tight you need the Micro Mini Loader from Dial A Digger. Get in touch today to get an obligation free quote on hire for this or any other plant equipment. We service Melbourne, Adelaide and their surrounding suburbs such as Werribee, Dandenong, Seaford, Brighton, Tea Tree Gully and Munno Para, so get in touch today.